"Another of the suspended skiers was Robel Teklemariam who is set to become the first Ethiopian competitor in a Winter Olympics. Robel Teklemariam said he hopes his countrymen's long-distance records on the track will translate into success in the cross-country skiing events. Teklemariam, who left Ethiopia as a child, says without the financial help of Ethiopians abroad, he would not have made it to February's games in Italy. 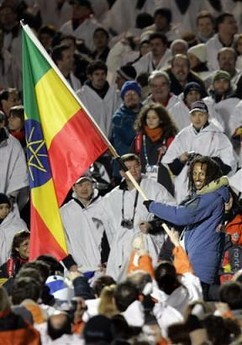 He was so determined to compete that he set up a national skiing federation to get the sport recognised for Ethiopia. Teklemariam, who has been training professionally for three years, took up skiing soon after arriving in the United States at the age of nine. The 31-year-old says he has not forgotten his roots and speaks Amharic. "There are two things I absolutely love - besides my family - and that's skiing and Ethiopia," he told the BBC's Fast Track programme. He draws much of his inspiration from Ethiopian athletes, who are renowned for their stamina as runners. Bikila went on to win another Olympic gold in the 1960s and became the first athlete to win two Olympic marathons. Teklemariam says even if he does not win a medal at the games that open in Turin on Friday, he hopes his appearance there will inspire other Ethiopians - especially those living in colder climes. "Being a distance sport, a sport for endurance, I think eventually Ethiopians will do pretty well in skiing cross-country down the road." He is grateful to the many Ethiopians in the diaspora who have supported him over the last three years and to his family, without whom he says could not run the Ethiopian National Skiing Federation. "I'm hitting the peak period for a distance athlete, so it's now or never," he said. This entry was posted on February 10th, 2006 at 09:32 by apache and is filed under Sport, Ethiopia, People.